THE HOLY LAND PHOTOS' BLOG: Ancient Coins — A Great 10 Minute Video (Carl Rasmussen). The folk over at the Friends of the Israel Antiquities Authority have placed on their Facebook page an informative, entertaining 10 minute video on Ancient Coins. IMHO it is well–worth viewing. Especially interesting is how the coins were produced and some hard to get behind the scenes at museums, libraries, and the Israel Antiquities Authority. This really is a good video, with excellent production, fine visuals, informative content, reference to coins from antiquity to the Islamic era, and an engaging presenter. Cross-file under Numismatics. BIBLIOGRAPHIA IRANICA: The Jews of Iran. Notice of a new book: Yeroushalmi, David. 2017. The Jews of Iran: chapters in their history and cultural heritage (Bibliotheca Iranica : Judeo-Iranian and Jewish Studies Series 4). Costa Mesa, California: Mazda Publishers. Follow the link for description, TOC, and publisher link. ANCIENT JEW REVIEW: Book Note | A Century of Miracles: Christians, Pagans, Jews, and the Supernatural, 312-410 (Peter Morris). H.A. Drake A Century of Miracles: Christians, Pagans, Jews, and the Supernatural, 312-410. Oxford: Oxford University Press, 2017. Historians in the twentieth century tended to read the fourth century as a great conflict between diametrically opposed ideologies: “paganism” and “Christianity.” Drake argues that these historians—influenced by the categories and anxieties of the Cold War—exacerbated a tendency amongst scholars to narrate the fourth century as a “black and white” contest between two incommensurable ideologies that for power over the late Roman Empire (19-21). In contrast to this approach, Drake contends that it might be better to look to a center of interests, concerns, and attitudes that were shared by those with varied religious identities. This shared middle is revisited and expanded throughout the book, and is fully on display in Drake’s chapters that describe Judaism. PROF. YAIRAH AMIT: The Exposition of the Garden of Eden Story (TheTorah.com). Interesting idea. Now what is the relationship of the Eden story in Genesis to the alternate account of Eden in Ezekiel 28? Another essay? GRUESOME OSTEOLOGY: Ancient beheading site found in Jerusalem, evidence of ‘holy’ king’s bloody rule. Archaeologists now know whodunnit — the Hasmonean king Alexander Jannaeus — after uncovering a 2,000-year-old mass burial ground in the municipality’s backyard (Amanda Borschel-Dan, Times of Israel). I'm going to register a little skepticism. The Roman era had no shortage of butchery. There were many episodes in which men, women, and children were slaughtered. It's safe to infer that we don't know about all of them. I have recently been reading Plutarch's Lives. Murders of political opponents, with their families and supporters, are a common occurrence in them. Something horrible happened here. But I hesitate to identify it confidently with a specific event that happens to show up in our surviving records. I'm sure the archaeologists have considered this carefully. At the same time, our media culture provides lots of incentive to tie archaeological discoveries to already-known events. I am not an archaeologist and I may be completely wrong here. But I will be more confident about the conclusions once they are published in a peer-review venue, reviewed by other archaeologists, and generally accepted as correct. If they are. Also, a small correction to the article: the Pesher Nahum does apparently allude to the mass crucifixion by Alexander Jannaeus. But the details about it come from Josephus (J.W. 1.97-98). UPDATE (21 October): I had read this article to say that this discovery was being associated with a specific, already known, event in the reign of Alexander Jannaeus. After reviewing the media coverage I think I misunderstood the claim. It was that this was evidence for an atrocity during his reign, not necessarily that specific one. That makes sense. Please discount my comments above accordingly. Apologies for the misunderstanding. THE INTERNATIONAL ORGANIZATION OF QUMRAN STUDIES: 10th Meeting of the IOQS (Aberdeen, 4‒8 August, 2019): Call for Papers. The subject for the 2019 meeting is "The Dead Sea Scrolls in the Context of Hellenistic Judea." This meeting is in association with the 2019 IOSOT annual meeting. Follow the link for details. However, when I try to link to the post itself, the result is a 404 error, which implies the post is gone. So I have just linked to the main page of the blog, where the post still appears. I assume the information is still valid. SAD NEWS: Remembering Ilana Sasson. Memorial lecture will focus on ‘materiality’ of Cairo Geniza (Lois Goldrich, Jewish Standard/Times of Israel). I am very sorry to learn of the death of Dr. Sasson last year. I had never met her, but I was aware of her work on the Karaites and Judeo-Arabic. I posted on her and her work here and here. SAMARITAN WATCH: Samaritans view part of ancient Torah scroll stolen from them in 1995. 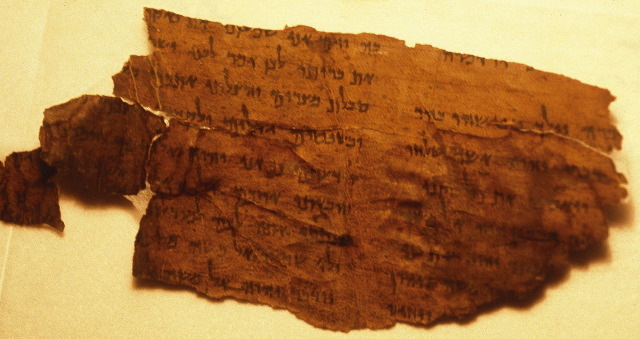 Parchment found during a routine customs check of a backpacker seeking to exit Israel to Jordan through the Allenby Crossing (JTA via Times of Israel). More than 20 years after the theft of ancient Torah scrolls from a Samaritan synagogue in Nablus, the Israel Antiquities Authority retrieved one page from the missing objects and invited its owners to view it. Uri Mendes, the deputy head of the Civil Administration body that governs the West Bank, showed the retrieved parchment last week to leaders of the Samaritan community, whose Torah is said by adherents to reflect what the ancient Israelites practiced before the Babylonian exile. I noted a detailed article on recovery of the column (rather than "page") of the scroll here. Note the correction in the update. A FEW NOTES on the recently-announced first-century CE inscription discovered near Jerusalem, the one that refers to Jerusalem with a plene spelling. At the Bible and Interpretation website, David M. Jacobson obliges: Comment on the Announcement of a New Herodian Inscription Found in Jerusalem. He proposes to read the Greek name with a different spelling. I think he's right. Paleographically, the letter in question looks more like a yod than a vav. And yod gives a more accurate pronunciation of the Greek name. I have been pondering the spelling of the name Jerusalem in Hebrew letters. I haven't seen a full historical account anywhere, so here goes. The following is technical. But some readers will be interested. Others may want to skip the next several paragraphs. The word "Jerusalem" is today pronounced Yerushaláyim in Hebrew. The vowel of the final syllable -áyim is an original diphthong, -*ay. By the time of the Masoretic vocalization, this diphthong had collapsed to -áyi in an accented syllable, as here, but to long "e" -ȇ in an unaccented syllable. The normal spelling of the original -*ay diphthong in biblical Hebrew is with the yod (whether or not with the accented or unaccented Masoretic pronunciation). This is also the normal spelling in the surviving Iron Age inscriptions. That means that the normal biblical spelling of Jerusalem in Hebrew, without the yod, is an anomaly. We would expect the longer spelling, based on how the diphthong is spelled in other words. The short spelling of Jerusalem also appears in the Khirbet Beit Lehi/Lei inscription, which I mentioned earlier. The transmission of names tends to be conservative, so it looks like the biblical and Iron Age spelling of Jerusalem is doubly archaic. It goes back to the earliest spelling of the name, tenth century BCE or earlier, which would not have included any internal vowel letters. Hence, no yod. So we would have expected the longer spelling in the Bible, but we get a more archaic, short spelling most of the time. When we do start getting the longer spelling, it most likely signals that the Masoretic pronunciation Yerushaláyim was starting up at that time. This is an interesting point for the historical development of the pronunciation of Hebrew. This new inscription is one piece of evidence that the pronunciation change was underway by the first century CE. The original press release did not specify this point, but others have noted it since (e.g., in the ETC Blog post quoted above). The original press release also underlines that this is the earliest example of the full spelling on a stone inscription, which, as far as I know, is correct. It does not mention that the full spelling also appears a number of times in the Dead Sea Scrolls at around the same time. But that point does come up in later coverage, such as here. There is nothing groundbreaking in this inscription. But it gives us a few bits of new information and it is good to have it. THE OTTC BLOG: Hebrew Transcription in Origen's Secunda. Drew Longacre draws our attention to Benjamin P. Kantor's 2017 doctoral dissertation, which deals with the Second Column of Origen's Hexapla. The full text of the thesis is available on Academia.edu. FOR YOU, SPECIAL DEAL: Free articles from Dead Sea Discoveries. To celebrate the 25th Volume of Dead Sea Discoveries, 25 articles from the past 25 Volumes will be available for free downloading during 2018. Follow the link above for the links to the individual articles. They are only there for four more days! THE ETC BLOG: Call for Papers for 2019 IOSOT Meeting at University of Aberdeen (John Meade). The IOSOT is the International Organization for the Study of the Old Testament. MARITIME ARCHAEOLOGY: Meet Zeno, the Tiny Sub Discovering the Secrets of Israel's Coasts. Israeli and Italian experts have recently tested a tiny wireless device that can map buried treasure (Moshe Gilad, Haaretz premium). “A shortcut.” That was the description given last week to a series of experiments held in Israel by a group of marine archaeologists and computer experts from universities in Rome and Florence. The task in which the Italians have been engaged, in cooperation with the Israel Antiquities Authority, is facilitating the discovery and mapping of archaeological finds spread out across the bottom of the sea – relatively fast and inexpensively. To that end, the Italians are developing the Archeosub – an autonomous underwater vehicle, or AUV, called Zeno. It’s a tiny unmanned submarine that will be able to discover, survey and monitor large areas of the seabed. Offshore sites ranging from the Neolithic to the Fatimid periods could benefit from this device. Caesarea is a key site for exploration, but there are many more. This is a long, detailed article. It requires free registration with Haaretz for full access. Past PaleoJudaica posts on maritime (or marine or underwater) archaeology are here, here, here, here, here and links, here, here, here, here, and here. Cross-file under Technology Watch. DAY CONFERENCE: The Dead Sea Scrolls and Digital Scholarly Editions Michael Langlois gives the program of this event, which he attended. It happened at Haifa University a couple of days ago. COMING SOON: MATERIAL OF CHRISTIAN APOCRYPHA. It takes place on 30 November to 1 December 2018. Follow the link for full details. The articles collected in Scholar and Kabbalist: The Life and Work of Gershom Scholem present diverse biographical aspects and the scholarly oeuvre of arguably the most influential Jewish-Israeli intellectual of the 20th century. Immigrating to Palestine in 1923, Gershom Scholem became one of the founders of the Hebrew University in Jerusalem and was the first to establish Jewish Mysticism as a scholarly discipline. The articles collected here reflect the diversity of Scholem’s intellectual scope including his contribution to Jewish Studies as a scholar of Kabbalah, religion and history, as a bibliophile, and an expert librarian of Judaica. Central aspects of Scholem’s impact on Jewish historiography, literature and art in Israel, Europe and the US, are presented to the reader for the first time. I noted some other recent books on Scholem here and links. ISRAEL ANTIQUITIES AUTHORITY PRESS RELEASE: Second Temple Period stone inscription noting the full spelling of Jerusalem found. The unique stone inscription, found this last winter, dates to the Second Temple Period (first century CE) and mentions Jerusalem for the first time using the Hebrew spelling as we know it today. (Posted at the Israel Ministry of Foreign Affairs website.) Many readers will have heard that the IAA promised to make public an important epigraphic discovery today. This is it. There is a lot more information about the excavation in which it was found, the historical importance of the inscription, and other interesting artifacts that are going on display with it at the Israel Museum. Unlike the "Jerusalem Papyrus," which came to light in 2016 and could well be a forgery, this Jerusalem inscription was scientifically excavated. It is a genuine ancient inscription. It is the oldest surviving example of the modern (plene or full) spelling of the name [update: that is, on a stone inscription], but it is not the oldest surviving mention of the city. The oldest Hebrew rendering I know of is from Beit Lehi. See here and here, and also (under the name Khirbet Beit Lei) here. Jerusalem is also mentioned in Akkadian in the fourteenth century BCE Amarna Letters. THIS WEEK'S DAF YOMI COLUMN BY ADAM KIRSCH IN TABLET: Strings Attached. In this week’s ‘Daf Yomi’ Talmud study, two schools of biblical thought diverge over the ritual clothing fringes. Plus: Does a dead man get to wear tzitzit? Yet here is an example of change as well as continuity, since today’s tzitzit do not include a sky-blue thread; the fringes are all white. That is because the “sky-blue” mentioned in the Torah is not simply a color, but a specific dye—tekhelet, made from a particular species called hilazon. In the ancient world, this was an expensive luxury, and at a certain point after the fall of the Roman Empire, the technique of making it was forgotten—indeed, today no one knows for sure exactly what a hilazon is. (The most likely candidate is a kind of snail.) So we are no longer able to fulfill the Torah commandment completely. For past PaleoJudaica posts on tekhelet dye, start here and follow the links. THE NSEA BLOG: DOCTORAL POSITION: GRAECO-COPTIC LEXICOGRAPHY, BERLIN. Just noticed this one, which was posted a week ago. This is a part-time job that is tied to a PhD. The postmark deadline for applications is 15 October 2018. It is also possible to e-mail an application If you are interested, hurry! A murder at that other Jericho? THE HOLY LAND PHOTOS' BLOG: Murder of a Jewish High Priest at NT Jericho (Carl Rasmussen). There is no way to know whether Josephus' account of the death of Aristobulus III is true. But Herod did murder a lot of people. Anyhow, the post has some good photos. Background on Herodian Jericho is here. BIBLE HISTORY DAILY: How Old Is That? Dating in the Ancient World. An introduction to scientific dating methods (Jennifer Drummond). In the September/October 2018 issue of Biblical Archaeology Review, David A. Warburton provides an introduction to scientific dating methods in his article “Dating in the Archaeological World.” This is the first article in a new BAR series called Biblical Archaeology 101. If you were hoping for an article on courtship in antiquity, you're out of luck. But I can tell you that it did not involve dating. As usual, the BAR article is behind the subscription wall. But this BHD essay gives you some basics from it. Did God abandon the Garden of Eden? IS THAT WHAT HAPPENED? God Abandons the Garden of Eden and Dwells with the Cherubim (Dr. Raanan Eichler, TheTorah.com). Four Aramaic targumim (ancient translations) have God, and not just cherubim, taking up residence east of the garden. This is based on a slightly different vocalization of the Hebrew text, which is likely a more original reading than our current biblical text (MT). Could be. That is clearly the interpretation of the Targumim, but I'm not convinced that it was also the sense of the original Hebrew. One weakness of this reading is that the meaning of so many of the suggested parallel passages is also in doubt. THE NSEA BLOG: CFP: CHARMS, CHARMERS, AND CHARMING. THE RELIGION PROF BLOG: Museum of the Bible. James McGrath has visited the Museum of the Bible. He seems to have liked it. He reports with a long photo-essay. It has uncountably many pages. Or at least I lost count. Plus approximately a zillion photographs. WILLIAM ROSS: SEPTUAGINT SCHOLAR INTERVIEW: JOHN A. L. LEE. It's been a while, but here, at last, is another of William's interviews with a Septuagint scholar. For his past interviews, see here and links. TALMUD WATCH: The Algorithms Translating Talmud. A new edition of the Babylonian Talmud has human translators collaborating with advanced algorithms (Simone Somekh, Tablet Magazine). No, AI is not translating the Talmud. Not yet. But this article tells about the algorithms that are aiding the translators of the new Italian translation of the Talmud. The small team of developers Piperno recruited knew that no existing translation software could handle this type of work; new algorithms were needed. Based in Rome, the group created a computer-assisted translation software that memorizes all translations performed by the human collaborators, storing them into a cloud in order to facilitate future ones. They named it “Traduco,” which means “I Translate” in Italian. The translators divide the text into paragraphs and strings, then select the portion they want to translate; the software searches for similar excerpts and corresponding translations in its database and offers the translators a list of suggestions. “The software has ultimately become an excellent tool for analysis of the text itself and of the quality of the translations,” Michael Dollinar, an IT manager who worked on Traduco, told Tablet. He explained that the software doesn’t translate the Talmud; it makes suggestions to the human translator, increasingly developing an interconnectivity between different passages that no other translation software allows. This feedback loop is meant to enhance the work’s overall accuracy and coherence. This is a remarkable use of algorithms that, in effect, makes the human translators into cyborgs with machine-level precision of memory. Background on the Italian translation of the Talmud is here and links. Cross-file under Technology Watch and The Singularity Is Near. DR. GILI KUGLER: Moses Dies at the Age of 120 — Was it Premature? (TheTorah.com). The end of Deuteronomy recounts that at an age of one hundred and twenty Moses says he is no longer able/allowed to lead the people’s journey and will therefore not be carrying them on to cross the Jordan (Deut 31:2). According to other places in the Torah, however, Moses dies because of a sin – his or of the people. BIBLE HISTORY DAILY: Understanding Israel’s 10 Commandments. Are the 10 Commandments really a moral code? (Shawna Dolansky). A nice overview of the Decalogue from a scholarly perspective. Everyone agrees it contains ten commandments, but different traditions divide them up differently. I have commented on the meaning of the sixth commandment (prohibiting "murder," sort of) here. There is more on the (Samaritan) stone decalogue tablet, pictured in the essay, here and links. PUNIC WATCH: Cartagena, Spain, has been celebrating its annual Romans and Carthaginians Festival over the last week. I have been watching for news, but so far all I have found is one notice of the festival, here, from Murica Today. Cartagena was a Punic town founded in the third century. If I find anything more about this year's festival, I'll let you know. Usually someone posts a report. Past posts on the history of Cartagena and its modern festival are here and links.